Khalid Sheikh Mohammed (KSM) is an al-Qaeda operative and attack planner held by the United States at Guantanamo Bay Detention Center. He is the self-professed mastermind of the 9/11 attacks, and claims to have planned or helped to plan 30 other terrorist attacks or plots.Terry McDermott, “9/11 Mastermind Khalid Sheikh Mohammed Finally on Trial at Guantanamo,” Daily Beast, April 4, 2012, http://www.thedailybeast.com/articles/2012/05/04/9-11-mastermind-khalid-sheikh-mohammed-finally-on-trial-at-guantanamo.html. He is the uncle of Ramzi Yousef, a Pakistani terrorist convicted of carrying out the 1993 World Trade Center bombing. KSM was captured by Pakistani authorities in 2003 and transferred to Guantanamo in 2006. In 2008, he and four co-defendants were charged on eight counts of capital murder. His trial is ongoing.“9/11: Khalid Shaikh Mohammad et al. (2),” Office of Military Commissions, accessed February 28, 2017, http://www.mc.mil/CASES.aspx; “Khalid Sheikh Mohammed Fast Facts,” CNN, last modified December 22, 2016, http://www.cnn.com/2013/02/03/world/meast/khalid-sheikh-mohammed-fast-facts/. Terry McDermott, “The Mastermind,” New Yorker, September 30, 2010, http://www.newyorker.com/magazine/2010/09/13/the-mastermind. Terry McDermott and Josh Meyer, The Hunt for KSM, (New York: Little, Brown and Company, 2013). “The Guantanamo Docket: Khalid Shaikh Mohammed: JTF-GTMO Assessment,” New York Times, accessed February 28, 2017, https://www.nytimes.com/interactive/projects/guantanamo/detainees/10024-khalid-shaikh-mohammed/documents/11. “Khalid Sheikh Mohammed Fast Facts,” CNN, last modified December 22, 2016, http://www.cnn.com/2013/02/03/world/meast/khalid-sheikh-mohammed-fast-facts/. Later that year, U.S. authorities attempted to capture KSM in Qatar, though he had received a tip and fled to Pakistan. Settling in Karachi, KSM reportedly traveled to the Tora Bora Mountains in eastern Afghanistan where he met with Osama bin Laden for the first time since 1989. KSM appealed to bin Laden for funds and material to carry out a largescale attack in the United States. KSM initially proposed hijacking an airplane and crashing it into the CIA headquarters in Langley, Virginia—though bin Laden dismissed the CIA as an inconsequential target. Bin Laden, however, agreed to fund an attack and asked KSM to join al-Qaeda. KSM declined, saying that he only sought the means to carry out an attack and wished to operate independently.National Commission on Terrorist Attacks upon the United States, Thomas H. Kean, and Lee Hamilton. 2004. The 9/11 Commission report: final report of the National Commission on Terrorist Attacks upon the United States. (Washington, D.C.): 147, http://govinfo.library.unt.edu/911/report/911Report.pdf. National Commission on Terrorist Attacks upon the United States, Thomas H. Kean, and Lee Hamilton. 2004. The 9/11 Commission report: final report of the National Commission on Terrorist Attacks upon the United States. (Washington, D.C.): 149, http://govinfo.library.unt.edu/911/report/911Report.pdf. In late 1998 or early 1999, bin Laden officially approved KSM’s plot to weaponize airplanes and crash them into buildings in the United States.National Commission on Terrorist Attacks upon the United States, Thomas H. Kean, and Lee Hamilton. 2004. The 9/11 Commission report: final report of the National Commission on Terrorist Attacks upon the United States. (Washington, D.C.): 149; 167, http://govinfo.library.unt.edu/911/report/911Report.pdf. At some point in 1999, KSM moved to Kandahar and began providing the group with “media facilitation and technical assistance,” according to the U.S. government.“The Guantanamo Docket: Khalid Shaikh Mohammed: JTF-GTMO Assessment,” New York Times, accessed February 28, 2017, https://www.nytimes.com/interactive/projects/guantanamo/detainees/10024-khalid-shaikh-mohammed/documents/11. KSM’s role in the terror group grew with the new millennium. In late 2000, KSM was appointed head of al-Qaeda’s media committee in Kandahar.“Verbatim Transcript of Combatant Status Review Tribunal Hearing for ISN 10024,” Guantanamo Transcript, March 10, 2007, http://i.a.cnn.net/cnn/2007/images/03/14/transcript_ISN10024.pdf. He also worked to organize a network of safe houses in Pakistan to be used by al-Qaeda militants following the attacks. Many of these safe houses were reportedly operated by jihadists belonging to Lashkar-e-Taiba, one of Pakistan’s largest militant Islamist organizations.Terry McDermott, “9/11 Mastermind Khalid Sheikh Mohammed Finally on Trial at Guantanamo,” Daily Beast, April 4, 2012, http://www.thedailybeast.com/articles/2012/05/04/9-11-mastermind-khalid-sheikh-mohammed-finally-on-trial-at-guantanamo.html. On September 11, 2001, KSM watched television reports on the attacks from an internet café in Karachi.Terry McDermott, “The Mastermind,” New Yorker, September 30, 2010, http://www.newyorker.com/magazine/2010/09/13/the-mastermind. In the wake of 9/11, KSM continued to provide passage and shelter for al-Qaeda operatives in Pakistan.Terry McDermott, “9/11 Mastermind Khalid Sheikh Mohammed Finally on Trial at Guantanamo,” Daily Beast, April 4, 2012, http://www.thedailybeast.com/articles/2012/05/04/9-11-mastermind-khalid-sheikh-mohammed-finally-on-trial-at-guantanamo.html. In November 2001, following the death of al-Qaeda military chief Mohammed Atef, KSM assumed responsibility for al-Qaeda’s “Cell for the Production of Biological Weapons”—which oversaw the production of anthrax and other agents, according to KSM’s own account.“The Guantanamo Docket: Khalid Shaikh Mohammed: JTF-GTMO Assessment,” New York Times, accessed February 28, 2017, https://www.nytimes.com/interactive/projects/guantanamo/detainees/10024-khalid-shaikh-mohammed/documents/11. Terry McDermott, “The Mastermind,” New Yorker, September 30, 2010, http://www.newyorker.com/magazine/2010/09/13/the-mastermind. Following the alleged beheading, KSM continued to plot terrorist attacks and assume higher positions within al-Qaeda. In December 2002, he was appointed to al-Qaeda’s Chief of External Relations, according to his own account.“The Guantanamo Docket: Khalid Shaikh Mohammed: JTF-GTMO Assessment,” New York Times, accessed February 28, 2017, https://www.nytimes.com/interactive/projects/guantanamo/detainees/10024-khalid-shaikh-mohammed/documents/11. “The Guantanamo Docket: Khalid Shaikh Mohammed: JTF-GTMO Assessment,” New York Times, accessed February 28, 2017, https://www.nytimes.com/interactive/projects/guantanamo/detainees/10024-khalid-shaikh-mohammed/documents/11. That December, the Department of Defense’s Joint Task Force Guantanamo (JTF) concluded that KSM posed a high risk and was of high intelligence value.“The Guantanamo Docket: Khalid Shaikh Mohammed: JTF-GTMO Assessment,” New York Times, accessed February 28, 2017, https://www.nytimes.com/interactive/projects/guantanamo/detainees/10024-khalid-shaikh-mohammed/documents/11. The Senate Intelligence Committee later revealed in late 2014 that the CIA had waterboarded KSM at least 183 times.“The Senate Committee’s Report on the C.I.A.’s Use of Torture,” New York Times, December 9, 2014, https://www.nytimes.com/interactive/2014/12/09/world/cia-torture-report-document.html. National Commission on Terrorist Attacks upon the United States, Thomas H. Kean, and Lee Hamilton. 2004. The 9/11 Commission report: final report of the National Commission on Terrorist Attacks upon the United States. (Washington, D.C.): 154, http://govinfo.library.unt.edu/911/report/911Report.pdf. Josh White, Dan Eggen, and Joby Warrick, “U.S. to Try 6 On Capital Charges Over 9/11 Attacks,” Washington Post, February 12, 2008, http://www.washingtonpost.com/wp-dyn/content/article/2008/02/11/AR2008021100572.html?sid=ST2008021101227. “Accused 9/11 Plotters Begin Trials as Legal Issues Linger,” PBS Newshour, June 5, 2008, http://www.pbs.org/newshour/bb/terrorism-jan-june08-gitmo_06-05/. Between 2009 and 2012, the status of KSM’s trial fluctuated as U.S. authorities requested freezes and delays in the proceedings. In November 2009, the Justice Department announced that the trial would be transferred to a New York court room. That decision was reversed in April 2011 when Attorney General Eric Holder said that the trial would be re-transferred to Guantanamo. The capital charges were re-filed against KSM and his four co-defendants that May.“Khalid Sheikh Mohammed Fast Facts,” CNN, last modified December 22, 2016, http://www.cnn.com/2013/02/03/world/meast/khalid-sheikh-mohammed-fast-facts/. In May 2012, KSM and his four co-defendants appeared in public for the first time in more than three years for their arraignment at Guantanamo. In the 13-hour hearing, the five defendants refused to answer the judge’s questions, “trying to give the impression they [were] in a different world than the rest of the court,” according to the Associated Press.Associated Press, “5 charged in 9/11 attack resist Gitmo hearing,” Washington Times, May 5, 2012, http://www.washingtontimes.com/news/2012/may/5/911-mastermind-back-guantanamo-judge/. KSM attended his pretrial hearing at Guantanamo in October 2012, and likened the causalities in the 9/11 attacks to the “millions” killed by U.S. forces.“Khalid Sheikh Mohammed Fast Facts,” CNN, last modified December 22, 2016, http://www.cnn.com/2013/02/03/world/meast/khalid-sheikh-mohammed-fast-facts/. An attorney on the case, James Connell, told reporters in 2012 that the trial “will take years to complete, followed by years of appellate review.”Associated Press, “5 charged in 9/11 attack resist Gitmo hearing,” Washington Times, May 5, 2012, http://www.washingtontimes.com/news/2012/may/5/911-mastermind-back-guantanamo-judge/. Abdul MajidTerry McDermott, “The Mastermind,” New Yorker, September 30, 2010, http://www.newyorker.com/magazine/2010/09/13/the-mastermind. KSMTerry McDermott, “9/11 Mastermind Khalid Sheikh Mohammed Finally on Trial at Guantanamo,” Daily Beast, April 4, 2012, http://www.thedailybeast.com/articles/2012/05/04/9-11-mastermind-khalid-sheikh-mohammed-finally-on-trial-at-guantanamo.html. MukhTerry McDermott, “9/11 Mastermind Khalid Sheikh Mohammed Finally on Trial at Guantanamo,” Daily Beast, April 4, 2012, http://www.thedailybeast.com/articles/2012/05/04/9-11-mastermind-khalid-sheikh-mohammed-finally-on-trial-at-guantanamo.html. 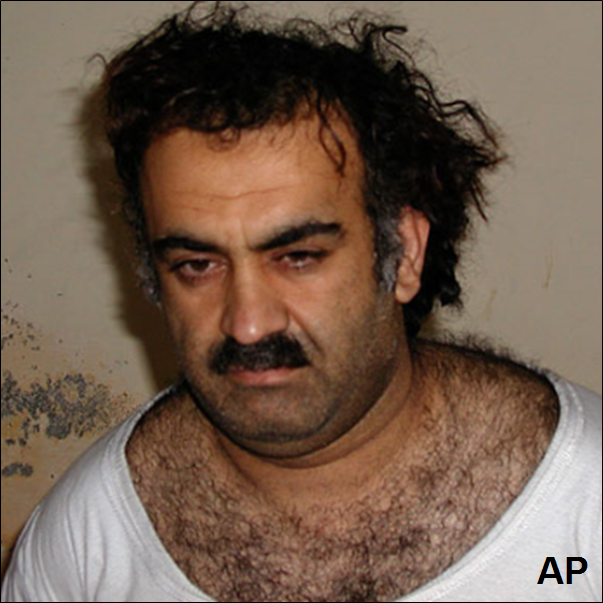 MukhtarTerry McDermott, “9/11 Mastermind Khalid Sheikh Mohammed Finally on Trial at Guantanamo,” Daily Beast, April 4, 2012, http://www.thedailybeast.com/articles/2012/05/04/9-11-mastermind-khalid-sheikh-mohammed-finally-on-trial-at-guantanamo.html. Khalid Sheikh Mohammed (KSM) is an al-Qaeda operative and attack planner held by the United States at Guantanamo Bay Detention Center. “That is what I wish. I wish to be martyred.”Jan Crawford Greenburg and Dennis Powell, “'I Wish to Be Martyred': KSM Arraigned,” ABC News, June 5, 2008, http://abcnews.go.com/TheLaw/story?id=5004288. “I was responsible for the 9/11 Operation, from A to Z.”“Verbatim Transcript of Combatant Status Review Tribunal Hearing for ISN 10024,” Guantanamo Transcript, March 10, 2007, http://i.a.cnn.net/cnn/2007/images/03/14/transcript_ISN10024.pdf. “I decapitated with my blessed right hand the head of the American Jew, Daniel Pearl, in the city of Karachi, Pakistan. For those who would like to confirm, there are pictures of me on the Internet holding his head.”“Verbatim Transcript of Combatant Status Review Tribunal Hearing for ISN 10024,” Guantanamo Transcript, March 10, 2007, http://i.a.cnn.net/cnn/2007/images/03/14/transcript_ISN10024.pdf. “[Bin Laden] is doing [the] same thing [as George Washington did]. He is just fighting. He needs his independence.”“Verbatim Transcript of Combatant Status Review Tribunal Hearing for ISN 10024,” Guantanamo Transcript, March 10, 2007, http://i.a.cnn.net/cnn/2007/images/03/14/transcript_ISN10024.pdf.